Swainby Village Store - source of my ham salad sandwich for lunch today. Osmotherley just a little beyond Yorkshire Water Cod Beck Reservoir where there is an a slightly off-road section on Route 65. Here I looked out for a little a sausage dog that had escaped his owner's lead and onto the higher ground. The journey across the top of the moors was very pleasant despite the weather. It can get a little lonesome when the weather is like this ...one of my companions for the day! The first really steep downhill section - given the wieght I was carrying on the bike, the wet road and the mud etc I had to take these very slowly! Although there were a few stretches of steep downhill before I reached the White Horse Hill above Kilburn nothing had really prepared me for the lengthy and severity of this drop - perhaps the home of the Yorkshire Gliding Club at the top should have been an obvious clue and the faces on the ten or so horse riders who had just made it to the top. Apparently in the Milk Race a few years ago riders effortlessly tackled this climb. 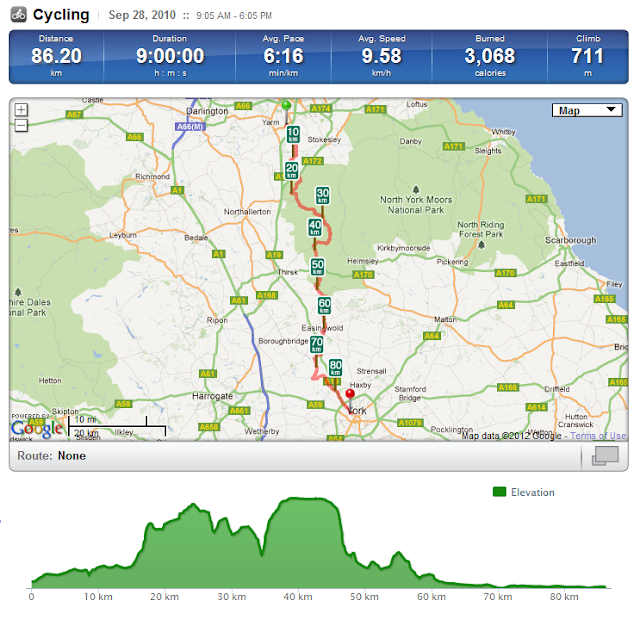 (very steep downhill by the white horse) and then along to Easingwold which was very pleasant. The ride down past Linton-on-Ouse to York was then fairly simple. Approaching York, I was reminded that it was a long way back to Edinburgh and I hadn't in fact taken the most direct route. The did note that the four track mainline here was particularly quiet for the whole time I passed. Bootham Bar - one of the gates in York City Walls provides access into High Petergate. West end of York Minster whose bells were ringing out loud and clear and could easily be heard from the YHA a mile away. Still some reoccurring issues with the back axle on the bike which I hope to get fixed whilst I'm in York. I've found a place on the internet that looks promising so here's hoping. At the recommendation of Jane, who studied Psychology at York University, I had fish and chips for supper buying these from Drake's in Low Petersgate.